TrackDay FAQ | FTLapps, Inc.
TrackDay Pro and TrackDay for iPhone are designed to be intuitive and easy to use. But, users still have a lot of good questions. If you don’t see the answer you need here, contact us at trackday@ftlapps.com or www.facebook.com/FTLapps, and we’ll get back to you ASAP! Also, feature and track requests are welcome! Q: Do the TrackDay apps work on tracks around the world? A: Yes! TrackDay Pro and TrackDay for iPhone work anywhere in the world using the “Learn” button — just run two or more laps, and it’ll figure out the rest. The “Learn” option is included with the Pro edition, and available as an in-app purchase in the iPhone edition. (A high-quality GPS signal will yield the best results.) Our Pro edition also features over 200+ predefined tracks around the world that you can download for FREE. And, if you’d like us to add a track, just send us the track name, link to their webpage, Trackpedia or Wikipedia page, or GPS location — anything that points us to what you want added. As long as Google’s (iOS 5) or Apple’s (iOS 7) satellite imagery shows the track clearly, we can usually add it for you within an hour or two! Q: OK, I have the app. Now, how do I get started? Touch the “Options” button on the bottom-right and change the settings for Units, Group and Vehicle to your preferences. Optionally, add information for the vehicle you’ll take on the track. Email is currently used by the app to populate the “To:” address of tracks (Pro edition, only), sessions and lap times that you export from the app. Please feel free to send us your sessions and lap times, or update the email address for your own purposes. Back on the main screen, touch the “Tracks” button to display a list of the tracks available in TrackDay. 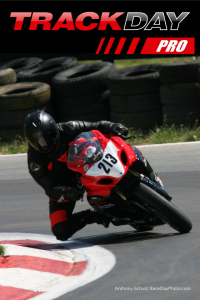 TrackDay Pro owners have free access to every track and Track Pack included in the FTLapps Track Store. For TrackDay for iPhone owners, the majority of the tracks in the Track Store may be purchased for $0.99, while, for a limited time, recently added tracks are available as free downloads. Track Packs, bundles of tracks for different groups, are generally available for about half the cost of purchasing the same tracks individually. Download or purchase the track that you’ll be on next, and touch “Sessions” to take a look at the “Track” screen. Touch points on the raceline to see speeds and change in velocity along the raceline. Two finger touch and other standard gestures can also be used to adjust the position and scale of the view. 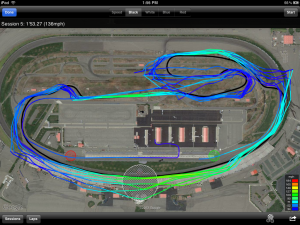 From the “Track” screen, at the track before you head out of the paddock, touch “Start” to begin capturing GPS samples. Once you’re back in the paddock, touch “Stop” to end the capture process. Within a second or two, the app will complete computation and storage of your session data. Touch “Sessions” to see the top speed and best lap time for that session. From that list, touch the new session to display the GPS data. Then touch the “Laps” button to see the lap times for all the laps in that session. Alternatively, for $2.99 TrackDay for iPhone owners can add the “Learn” option — this option is included with TrackDay Pro. Touch the “Learn” button, enter the name of “the track,” press “Start” and run a few laps, then press “Stop.” With two laps or more, the app will have the data it needs to compute the start/finish location, raceline, pit out and pit-in. This feature can be used anywhere — but please make sure to follow the rules of the road and stay safe! 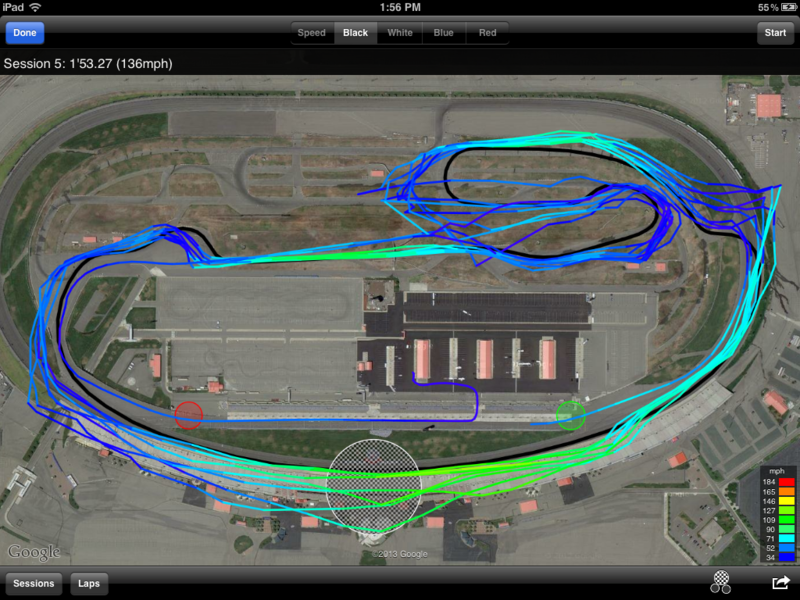 TrackDay Pro owners can also “create” their own tracks using the built-in track editor. For more information, take a look at the tutorial included on our TrackDay Pro Track Editor page. Check out the rest of the Q&A. If you still have a question about the TrackDay apps when you hit the end of this list, just let us know! Q: I have an iPhone 5 / have upgraded to iOS 6, will the TrackDay apps still work properly? The Track Editor depends on high-resolution satellite imagery with ultra-high-performance map tile caching. Google Maps satellite imagery available with iOS 5 is extremely detailed for over 95% of the tracks around the world (of the over 120 tracks we’ve sampled, only four have had data that was insufficient for our application) — as of our latest test (December 2012) the capability offered in iOS 6 does not appear to be as robust. We also found the lack of tile caching performance to be a serious problem. On the track, iOS 6 has produced reasonably accurate GPS location data, but seems to suffer from two problems: 1) The iOS 6 location services appear to be extrapolating location from the last known position and velocity — if the GPS signal is lost in a turn, this extrapolation may introduce fairly serious location errors. We may be able to mitigate this problem in a future release, but as of the 2.2 release, with iOS 6, it’s more important than ever to have a high-quality GPS signal in order to produce accurate session results. 2) With iOS 6, the map view displayed by the app is now dependent on map tile data from Apple’s servers — early test results suggest that map tile updates may be degrading app performance. Modifications to mitigate this problem are planned for our 3.0 release. Q: I just updated to the latest version of the app, but it still has an old track. What’s going on? A: The track data and your sessions are completely independent of the app version. You can get our latest track updates from the FTLapps Track Store: Touch the “Tracks” button, then touch “Refresh” to ensure the list reflects the latest set of tracks and any price changes (for TrackDay for iPhone). Then, scroll down into the Track Store section of the list until you spot the desired track. If an update is available, it will show “Update” on the right side of the list. Touch the list item and it’ll open the Track Store page. From there, touch the “Update” button to get the latest changes! Q: It is impossible to start the session with gloves on, and impossible to stop when you are going that fast down the straightaway — how am I suppose to use the app without “Auto Session Start”? A: The expectation we have is that while in the paddock (before putting on your gloves), from the Track screen, you’ll press “Start” — then, put on your gloves, head to the grid, and from there, out onto the track. At the end of the session, after you have the bike on stands (or the kick-stand), turned off, and your gloves off, then you’ll press “Stop” — the app will compute for a second or two, and your lap times will then be available by touching the “Laps” button. Please don’t attempt to interact with the app in any way while you’re out on the track! Q: When I go to the Track screen to start a session, I just see a message that says something about “location services” — what gives? A: If you haven’t already, snag the latest version of the app; 2.0 and higher have a clearer message. The message indicates that you have not enabled location services for the app. It’s a one-shot deal; if you didn’t give the app access to your location the first time the iPhone displayed the message ‘”TrackDay for iPhone” Would Like To Use Your Current Location’, iOS will never ask again. All the app can do from there is to let you know that the setting needs to be changed. To fix the problem, use the Settings app, touch “Location Services” then scroll down to “TrackDay for iPhone”. You’ll see that it shows “OFF”… Switch it to “ON” and you should be good to go! Q: My session results are erratic, sometimes stopping in the middle of a session — what’s up? A: In theory, “Auto Session Start” is a terrific idea. In practice, there are a variety of serious problems with the capability — it’s nearly impossible to predict the minimum speed that should be used as a threshold; too low, and you might as well use the manual start/stop, too high, and you’ll miss the pit-out feature before turning on GPS tracking — run-offs (slowing or stopping briefly on the side of the track) will typically generate a break in the session. For these reasons, in the 2.0 release, we defaulted the option to “OFF.” In the 2.3 release, we removed the Auto-Start capability entirely. If you’re not using the 2.3 release, you should update before heading to the track. If you’re still not getting the results you expected, send a session or two to us at trackday@ftlapps.com and we’ll take a look! Q: My lap times are erratic, and don’t seem to match the actual laps I rode. How can I fix this? A: In 2.0 and prior versions of the TrackDay apps, to ensure that laps are accurately captured, the GPS position (even one that is far away from the track) is clamped to the closest position on the track. Then, that motion from one moment to the next is used to capture start-finish crossings. If you’re capturing sessions at a track where the start-finish is immediately adjacent to the paddock area, the lap calculation may pick up movement in the paddock that happens to cause the clamped GPS position to move back and forth across the start finish. In the 2.1 release, we tuned this behavior (clamping is limited to the horizontal accuracy of the GPS sample — only points “close” to the track are forced onto the raceline). Move the start-finish feature a bit and reselect the session to recompute the lap times. If that doesn’t do it for you, send your sessions to us at trackday@ftlapps.com and we’ll be happy to take a look! Your feedback will help us to improve future versions of TrackDay Pro and TrackDay for iPhone. Q: Why would I want to change the Start-Finish, Pit-Out or Pit-In features at all? A: Much of our track portfolio has been developed using Google Maps satellite footage. Although the raceline and feature positions are generally very accurate, the variation in GPS position recording in your sessions, even with high accuracy, will sometimes result in missing Pit-In, Pit-Out, or hitting them while still on the raceline. With the 2.0 release, you can now make immediate adjustments at the track, and see the corrected results for each of your sessions. Q: How do I adjust the Start-Finish feature? A: To move a “feature” on the Track screen, touch the “three circle” button (“Feature Edit” toggle, available in 2.0 and higher) and it’ll light up red. Now, you can touch the start-finish feature to select. Then, touch-drag to move it. When you’ve repositioned it successfully, just touch the “Feature Edit” toggle button again to ensure future touches don’t modify the start-finish, pit-in or pit-out accidentally. Q: I want to create my own tracks using TrackDay Pro; how do I get started? A: A complete tutorial on the built-in track editor is included on our TrackDay Pro Track Editor page. Q: I used the “Learn” feature to create my own track, but now I want to download yours. How do I move the sessions from “my track” to yours? Tada! It’s a lot of steps… but within the app, you should find that the process is pretty straightforward. Q: My question isn’t here… what now? A: Email us at trackday@ftlapps.com or contact us at www.facebook.com/FTLapps! We’ve already received lots of great questions and ideas from our extended TrackDay team — please join us in making the TrackDay apps even better! That’s typically a sign that the GPS data isn’t crossing the region defined as the start-finish line. On the Track view, select your session, and look carefully at the black/white checkered circle. If the lap traces are passing it by, that’s the problem. Touch the “Feature” button at the bottom of the screen. Touch the black/white checkered circle, and touch-drag it or resize with the slider to intersect with the lap traces. You’re also welcome to send the session to us via email to trackday at ftlapps.com (just touch the “Action” button on the Track screen, then touch “Export All Sessions” — or select a session and touch the “Action” button and “Export This Session”.) — we’ll take a look, and should be able to tell you exactly what’s up. Also, if there is any problem with the app, we can use your data to understand what went wrong and fix it for you, and everyone else! Hi there. I was hoping to record a track day and wanted to overlay data onto the video clip using a Go Pro. I understand that I can use the render to do this but wanted to know weather I can export your data from this app into it..
What file format does this app use?? CSV, GPX???? TrackDay Pro will export a CSV-formatted copy of your session data (from the Track screen, select a session, then touch the Action button and select “Export RAW GPS Data”). If you’re using TrackDay for iPhone, the feature isn’t currently available — but we are considering releasing a “bundle” that’ll make it easy / cost-effective to upgrade to the TrackDay Pro edition. If you don’t already have the TrackDay Pro edition, contact us at trackday@ftlapps.com. Thanks for your purchases! On the Options screen, touch the action button on the top-right and select “Restore Purchases.” If that doesn’t do it for you, let us know! I have a track session that is listed on the wrong track. I don’t want to lose the session, but I need to move it the right track. Is there a way to do that? Thanks for your help! We absolutely love the app and use it all the time. I can’t even think of how many times I have recommended it to people. Everyone who sees us obsessing over it at the track immediately goes to the App Store and downloads it, annoyed because they already missed a session on it. Thank you for your support, that’s awesome to hear! There’s supposed to be a menu option from the Track screen that allows renaming the Session (it’s designed to support interaction with the “Learn” option) but testing with the preview of iOS 10 shows that the menu is not displaying properly. We’ll need to investigate further. In the meantime, feel free to contact us at trackday @ ftlapps.com — if worse comes to worse, we should be able to alter the export data so that you can import it to your target location.